Do you need extended setup time? I have read and understand the Rules and Regulations and agree that they are a part of this Contract. For example:stove, freezer, heater, cooler, coffee maker, deep fryer, blow dryer. Booths will be assigned to paid exhibitors on a first come first PAID basis. UNPAID applications will not be reserved. $150 non-refundable for booths, $50 for farmers market tables.No refunds within 30 days of the event and must be in writing. Access to the show area will be secured overnight beginning at time of exhibitor move in. Security will be provided, beginning at 9:00 p.m. Friday until 10:00 a.m. Sunday. Exhibitors are responsible for their property at all times. Security is provided to assist exhibitors in the protection of exhibits. Black Gold Rodeo Trade Fair Committee reserves the right to authorize and/or remove any questionable exhibit and or booth content. All exhibitors are required to have liability insurance coverage with a minimum coverage of one million liability. Each exhibitor preparing food, or displaying/showcasing equipment and/or products that are combustible must provide a fire extinguisher to be displayed within their booth at all times. . Specially built display may not exceed an overall height of 8 feet unless permission is received from the Black Gold Rodeo Trade Fair Committee. Unfinished wood, cardboard, etc. panels must be painted or otherwise appropriately finished if visible from other booths. All booths MUST BE MANNED during exhibit hours. There will be a complimentary booth attendant relief service available through the Black Gold Rodeo booth on a first-come first-served basis. The exhibitor assumes responsibility for compliance with local and provincial ordinances and regulations covering licenses, permit, fire, safety and health. Will be restricted to a maximum of eight (8) liters or two (2) gallons of gasoline per vehicles. Must ensure that batteries are disconnected. Must provide ground sheet under vehicles to prevent contact of dripping oil/gasoline or other fluids on floor surface. Propane and natural gas vehicles and/or propane cooking devices will not be permitted inside the building. As a protection to all exhibitors, management reserves the right to restrict exhibits which in its judgment, because of noise, safety or for any other reason, may be objectionable and / or detract from the character of the Trade Fair. No balloons are allowed as give-away items. Any inflatable objects used in display, must be safely secured and attached to such display to the satisfaction of the management. Products that cause hazards or pose a safety concern to public/exhibitors such as slip hazards, product that causes bodily harm, trip hazards, etc. will not be permitted at the discretion of the Black Gold Rodeo Trade Fair Committee. Committee members may request the termination of product use, relocation, etc. as deemed necessary. Restrooms and food facilities, including a licensed restaurant, are on site. A designated Exhibitor Lounge space will be set-up for exhibitors to take breaks and enjoy refreshments during the event. A private washroom is also available to exhibitors. Exhibitor Passes must be worn to access this area. During the show set-up period, the Black Gold Rodeo will operate a service desk on site to assist exhibitors with booth rental items and to deal with any problems or special requests of the exhibitors. In addition, the Black Gold Rodeo Trade Fair Committee will provide personnel on site for the duration of the show. Exhibitors should contact the Black Gold Rodeo personnel if service is required. 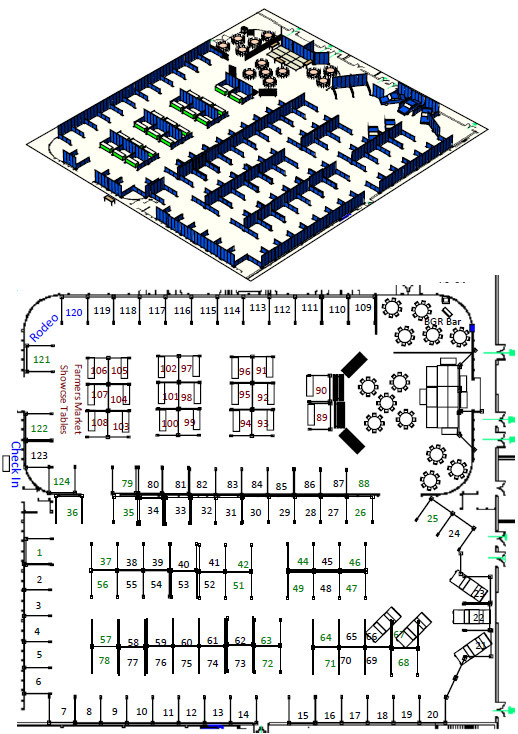 Exhibitors can note preferred locations for their booth. Booth assignment is NOT guaranteed and numbers will NOT be distributed or communicated until exhibitor move in. Leduc Black Gold Rodeo will not restrict or provide exclusivity to one service or product sold from another business selling or promoting a like or same service or product within the trade fair. Black Gold Rodeo Trade Fair Committee will do their best to have the booths allocated to different locations within the trade fair exhibit however cannot guarantee distance or location and will be at the discretion of the committee. To provide as much parking as possible for visitors and customers, all exhibitors and their personnel are to park in the overflow parking located directly north of the Leduc Recreation Centre along the tree line. Staggered move-in times will be in effect for all exhibitors. Exhibitors will be notified of their designated move in time by e-mail, prior to the event. Exhibits must be ready to open to the public on Friday, at the trade fair start time. To unload booth equipment & displays, please access the North side of the Leduc Recreation Centre. Exhibitors will be permitted to unload at this location and must move vehicles immediately after they have unloaded to allow access to other exhibitors. Any exhibitors providing machinery & vehicles may be required to move into their space with additional considerations, times and/or restrictions. Please contact 780-328-1675 for information. Outdoor Exhibiters will be located on the West parking lot of the Leduc Recreation Centre. with designated locations & move in times. When the show closes to the public exhibitors can remove their displays. No displays can be removed from the show prior to the show closing. Exhibitors must not extend their displays beyond the space allotted. Any exhibitor using sound equipment (video or audio tapes) should keep the volume at a minimum to avoid distracting other exhibitors. All display signage must be professionally prepared. The Black Gold Rodeo Trade Fair Committee reserves the right to remove such items that may be deemed inappropriate. Signs and/or posters cannot be affixed on any walls, curtains, or drape within the Leduc Recreation Center or the temporary structures within. Signage must not interfere with walkways and is not permitted on guest floors. Selling/Marketing of product/service - must be confined to your allotted area. Only exhibitors will be allowed to distribute materials or sell/market their product/service. Non-exhibitors must make prior arrangements with the Black Gold Rodeo Trade Show Committee for permission to distribute materials at the show. FREE Wireless internet access will be available through the Leduc Recreation Center. Exhibitors are responsible for following the guidelines and polices outlined on the log-in-page. Exhibitors must provide their own labour for the unloading of trucks and transportation of equipment and display materials to and from the exhibit area. The Black Gold Rodeo Trade Fair Committee and/or Leduc Recreation Centre does not provide labour for this purpose. Should you require assistance please contact the event services provider for this service. To avoid damage to flooring, wooden skids must be placed under all heavy pieces of equipment. Bolts or other fastenings must be countersunk below the surface of such skids, and sharp edges or nails that might scratch into the floor must be eliminated. All RVs and large vehicles must use the supplied materials to support vehicles during the load in and load out process. Any vehicle remaining in the show area must have drop cloths, drip pans, or appropriate materials underneath to ensure the protection of the floor below. The Black Gold Rodeo Trade Fair organization will hold the exhibitors liable for any damages to the property inside the Leduc Recreation Centre or its premises. Any people responsible for food must ensure the flooring is protected at all times. Drip trays, tarps, and carpet are all required. No open flames are allowed. Food service vendors are also responsible for the cleaning of the food preparation. All cleaning and service supplies are the responsibility of the vendor. Additional items such as stoves, floor coverings, refrigerators, etc. can be rented at the expense of the exhibiter through the contracted event service. It is strongly recommended that food service personnel arrange a viewing of the facility to ensure appropriate requirements. * Damage Deposits Exhibitors providing Food Services are charged an additional damage deposit fee of $200/booth which is refundable at conclusion of event where the area/location used has been confirmed it was returned in good condition by the Black Gold Rodeo Trade Fair Committee. Any charges for damages to equipment, facility, clean up, debris, etc. will be at the exhibitors expense and applied to the damage deposit first. If the damages & expenses exceed the damage deposit retained, the Black Gold Rodeo Trade Fair Committee may pursue additional fees, charges or legal action as deemed necessary to the business/exhibitor. All display materials including banners must be flame-retardant and may be subject to inspection by Leduc Fire Services. IN CONSIDERATION of participation in the Leduc Black Gold Rodeo, City of Leduc and Black Gold Rodeo Trade Fair committee members, the exhibitor shall indemnify and save harmless Leduc Black Gold Rodeo, City of Leduc and Black Gold Rodeo Trade Fair Committee members and all the members thereof, and all other groups working under the direction of the Trade Fair, from all fines, suits, proceedings, claims, liabilities or action of any kind or nature (including, but not limited to, cost and reasonable lawyer's fee) arising or growing out of or any way connected to the exhibitor's operation of the Exhibitor's booth and general participation in the Trade Fair. Exhibitors must complete and sign the official Trade Fair Application form and if by the show organizer, provide proof of coverage of insurance.